The Netflix movie version of the book has been one of the year’s more controversial movies. It’s been simultaneously hailed as ground-breaking and as not very good by different groups of critics. I don’t have an opinion on the film either way – I prefer to read and it’s fair to say that Josh Malerman’s Bird Box is a suspenseful, compelling novel that you’re going to want to see through to the end. The premise is a peculiar one. There is something out there. Something that if you catch so much as a single glimpse of it – it destroys your sanity and you become a crazed violent lunatic prepared to hurt anyone and everyone. No one knows what it is. Nobody has any idea where it might have come from. A group of survivors in hiding are dreaming of somewhere safer. Malorie and two children she cares for are among them. When the children come of age – it’s time to leave. However, there’s a catch, the journey requires that they spend 20 miles on a rowboat in a river, relying on nothing but hearing to guide them through. If they get it wrong – they will die. Something is stalking their boat too. Is it the “something out there” or something entirely more human? When the world goes mad, who can you trust? Who can you turn to? What are you capable of to save yourself or others? Bird Box tries to tackle these deep questions and for the most part it succeeds admirably. “This completely compelling novel contains a thousand subtle touches but no mere flourishes-it is so well, so efficiently, so directly written I read it with real admiration. Josh Malerman does the job like a fast-talking, wised-up angel,” says bestselling horror author Peter Straub. You should check out the price of Bird Box on Amazon and see if Josh Malerman’s book is for you. I loved it. 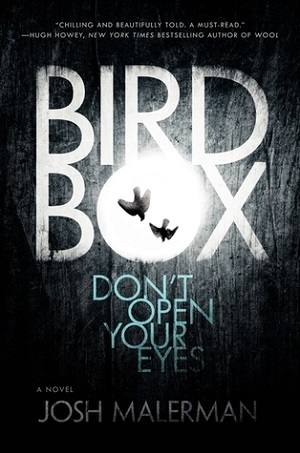 You can win a copy of Bird Box by Josh Malerman too. Mom Reads is happy to give one lucky reader the chance to read this for free! Enter Now! I would love to win the move gaveawy .